I have been printing with Formlabs 3D printers for almost 3 years and during that time, I have been waiting for a resin that is specific to dental model applications… that day is here! While there’s nothing wrong with the traditional resins I was using, which was typically the v2 or v3 Grey Resin, it has always been funny printing models that were grey, black, white, or clear. Dentists and dental technicians are used to working with beige or yellow colored stone models. I am not sure what it is about this color, but it resonates with us in the dental industry. Some say it’s the clarity and the ability to see delicate and detailed structures, others say it’s the accuracy and the precision of the material that matters, but I say it’s both! 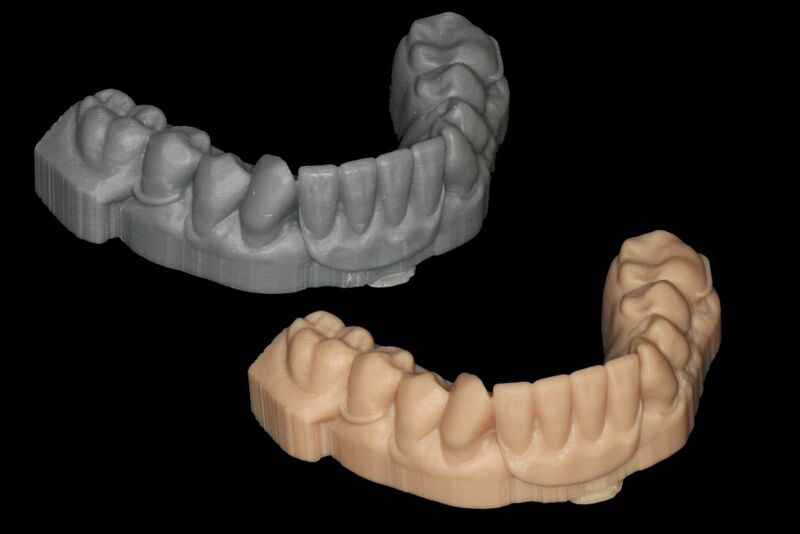 The real question is…is the Dental Model Resin material accurate? In short, Formlabs has specifically developed the Dental Model Resin to be an incredibly accurate resin. It is true, in dentistry, we rely upon accuracy and fidelity of our models. Imagine if we made an alginate or polyvinylsiloxane (PVS) impression of our patient’s teeth and it was only accurate enough just to look at the teeth, rather than being able to use it clinically for making things, like crowns or bridges. A patient came into my office with a broken lower right molar, tooth #30. He bit down into something and felt something crack on his tooth. Rubbing the area with his tongue, he suspected that he cracked a tooth. When he came into my office, I made the discovery…he only chipped his existing porcelain – metal (PFM) crown. I advised him that he can do nothing and watch the area, but he requested a new crown. He simply didn’t want to have to manage a chipped crown as he is concerned that the rest of it will break now. After placing anesthesia, I removed the crown and corrected any areas of roughness and existing problems with the previous tooth preparation. Using my 3M TrueDefinition scanner, I captured a digital impression of the tooth, the upper teeth, and the bite registration. I absolutely love skipping any impression material and can no longer imagine what it would be like to have to go back to the days of using PVS for making impressions. It truly has improved my practice without forcing me to change the way I practice dentistry. I made a temporary crown for the patient and had him return 2 weeks later for the final crown seat. 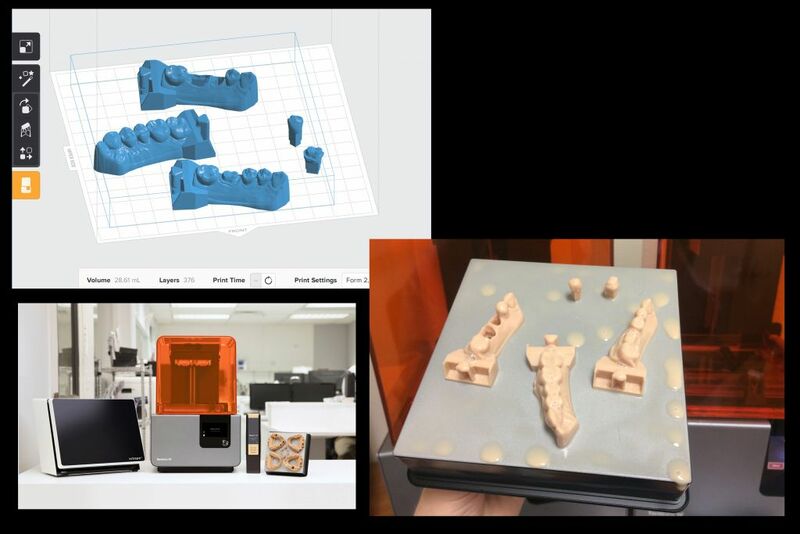 Since my scanner uses open STL architecture, I downloaded the STL file from my intraoral scanner’s connection center and started working with my 3shape Dental Systems software to build the models for working with a dental articulator. I completed the virtual margin marking, die-ditching, and model generation for my patient’s case using 3shape software and exported STL files of each individual model to 3D print using my Form2 printer. I imported the STL files of my 3shape models into my Formlabs Preform software and 3D printed it using the new Dental Model Resin material. As many of you know, I am not a big fan of printing anything with supports. 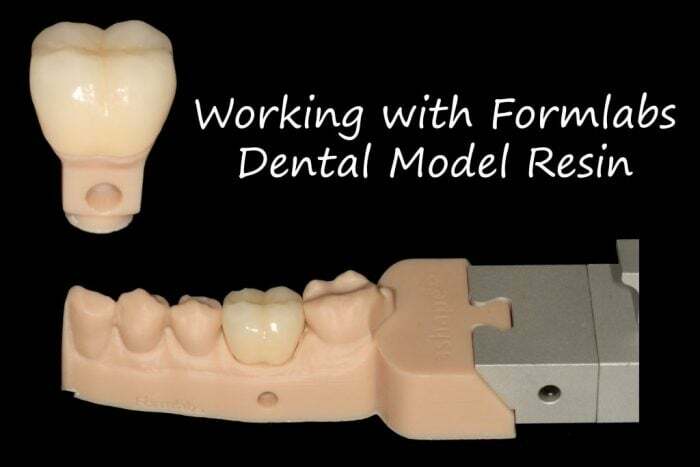 I am so thrilled the Dental Model Resin allows me to print dental models directly to the build platform! After printing, I removed the models from the build platform, cleaned them using isopropyl alcohol, and UV cured them in my curing machine. 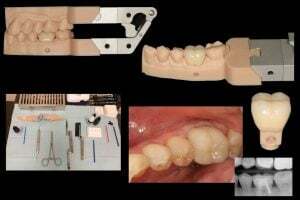 I assembled them on my articulator and sent to my dental lab (California Dental Arts) to have my technician fabricate a beautiful pressed eMax crown. I received the crown back from the laboratory, fitted to my Formlabs Dental Model Resin model, and noticed how amazing the fit of the crown was to the models. I always do a quality control check the day before the patient comes in where I check contacts, occlusion, and shade. This crown was perfect! I saw the patient the next day, removed the temporary, placed the crown and low and behold, very few adjustments to get it to fit. 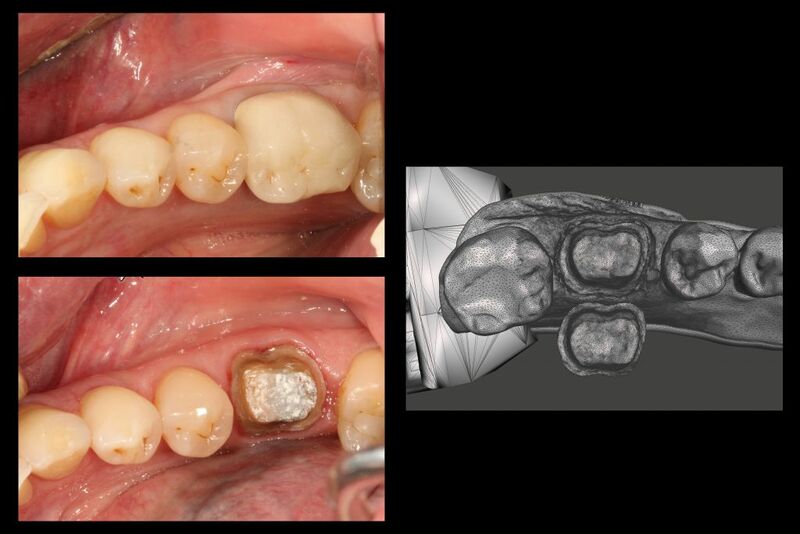 After the patient approved the color of the crown, I cemented it using resin cement. Notice in the photo how well the Formlabs Dental Model Resin and crown looks next to my normal dental instruments…it’s a natural fit! After cementation, I had one tiny adjustment to make to the occlusal surface, and polished it smooth. The patient was BLOWN AWAY how well the crown fits. As you may not have seen in my photos, he had a mouth full of crowns and veneers and this was his first crown using the digital process. He said it was the most comfortable crown procedure he has even had done. Ultimately, it put a smile on my face because amazing experiences and ultimately patient satisfaction is what makes me really smile as a dentist. My lab was happy because they had a predictable dental model for incorporation into their everyday workflows. I was happy that I was able to get a clinically acceptable fitting crown with excellent esthetics, and my patient was thrilled because he didn’t have to have gooey impression material used in his mouth. 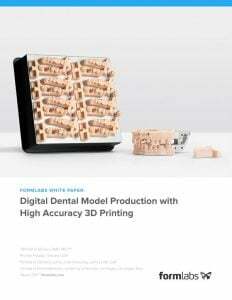 Formlabs just released their Dental Model Resin and I have been blown away how precise the model prints are for using in my everyday workflows. To find out more about my analysis of this material and my experience working with it in my practice, click on the Formlabs image to check out the whitepaper I wrote with an extensive accuracy analysis.